Cracks, holes, chips, and stains in showers and tubs made from fiberglass, acrylic, or even cast iron can sometimes be fixed yourself, and often quite inexpensively. There are several DIY products on the market that can help you patch holes, fill cracks, erase rust spots, and cover up blemishes. These may not be ultimate solutions, and in some cases, the fix may be functional but still quite visible. But they can save you hundreds or even thousands of dollars in the short-term, as well as extend the life of your shower or tub until you are able to replace it. Holes and cracks in fiberglass or acrylic tubs go beyond unsightly. When water infiltrates these openings, it can leak behind the unit and create pools of water, soak insulation, weaken studs, and even result in mold within the wall and floor cavities. 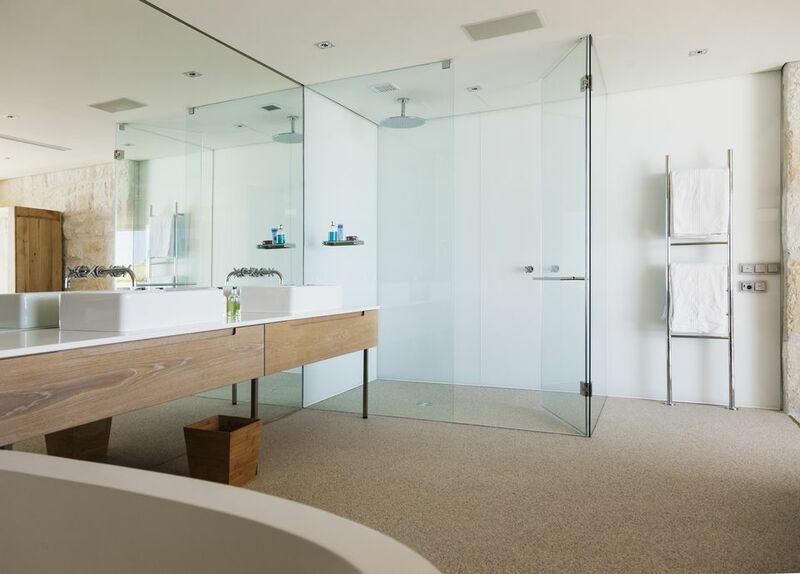 Whether it is a bathtub, shower stall, or combination bathtub/shower surround, the process for minor repairs is the same for both fiberglass and acrylic materials. The rule of thumb is that if the hole is smaller than 1/2 inch, you should be able to make the repairs yourself. If you are dealing with a larger hole, then replacement of the surround or unit might be in your immediate future. Fixing the problem area involves applying a two-part epoxy compound that hardens to the strength of the surrounding material. With general-purpose kits, basic colorants can help bring the color of the patch closer to the color of the shower or tub, but the color match is rarely perfect. Some manufacturers offer epoxy kits formulated to exactly match the most popular colors of showers and tubs from major fixture manufacturers. Knowing the exact manufacturer and model number of your shower or tub may allow you to buy an epoxy kit that is a very good match for your fixture. Clean the damaged area completely with the nonabrasive powdered cleanser. Rinse thoroughly, ensuring that no residue from the cleaner remains on the surface. Any residue that remains will compromise your fix, weakening it and shortening its life span. If directed by the kit, apply the reinforcement tape to the crack or small hole. In a disposable container, combine the resin with the hardener and coloring agent, following package directions. Spread the mixture over the tape or the damaged spot, feathering out the edges and creating the smoothest surface possible. Let the repair harden and cure completely, according to package directions. Sand wet with the wet-dry sandpaper provided. The paper should be no coarser than 600-grit. Sand lightly until the repair area feels smooth with the surrounding area. Although most bathtubs today are made of fiberglass or acrylic, older homes may still have enameled cast iron or steel tubs. When the protective coating on cast-iron or steel bathtubs flakes or chips away, you run the risk of the base material rusting beyond repair and developing leaks. Fixing these areas with porcelain paint nominally improves the look of the tub and usually prevents further rusting. Remove any flaking or damaged paint from the chipped area. If a great deal of paint needs to be removed, use a new straight razor blade with the blade held at nearly flat against the surface. Clean the chipped area with the rag and cleanser, then rinse thoroughly. Using at least 600-grit wet-dry sandpaper, wet the sandpaper and gently buff to smooth out any imperfections. Apply a small amount of touch-up paint and allow to dry and cure completely, per the package directions. If the painted area is not completely smooth, a second light sanding with wet-dry sandpaper will smooth out the repair area. Stubborn stains on showers or tubs can ruin its appearance. It's time to erase these stains when regular cleaning methods have failed. Cleaning stubborn stains from shower stalls or bathtubs involves starting with simple methods such as lemon juice and progressing to stronger, more caustic methods such as using mild acids. In most cases, the simple, organic, and less hazardous methods will be sufficient to eliminate the stain. Cut a lemon in quarters and rub the surface with the fruit. If you only have bottled lemon juice on hand, that will work. Next, rinse with water. Scrub the area with baking soda and a sponge, then rinse with water. If the stain still remains, try a solution of one part bleach to one part water; wear rubber gloves to protect your hands. As a last resort, try a 5 percent solution of oxalic acid or a 10 percent solution of hydrochloric acid. Either acid can be purchased at a hardware store or home center. Dab the solution on with a rag for just a couple of seconds, then rinse thoroughly. Wear rubber gloves, a mask, and safety glasses when working with those solutions.